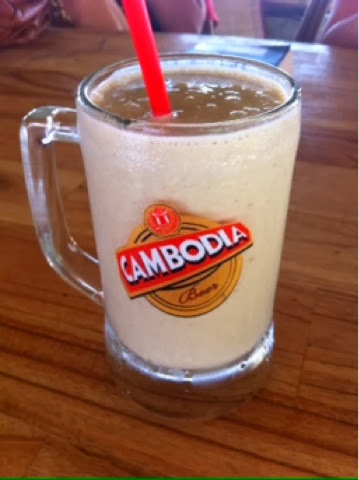 As you'll all know from my last post, I'm now in Cambodia. We left Koh Phangan on Saturday 21st, which feels like weeks and weeks ago now! Our journey from Phangan to Siem Reap was ridiculously long and particularly grim for the most part; it took us around 32 hours in total and involved a boat, several buses, a train, 2 taxis and at least 3 tuk tuks - hell! We got a boat from Phangan to the dock nearest Surathani, a 10 (probably nearer 12) hour coach to Bangkok (the absolute worst part -'I could have cried after about 5 hours due to uncomfortableness/tiredness). We arrived in Bangkok around 5am, got a tuk tuk over to the train station and waited around an hour for our train, which took around 6 hours to get near the Thai border. 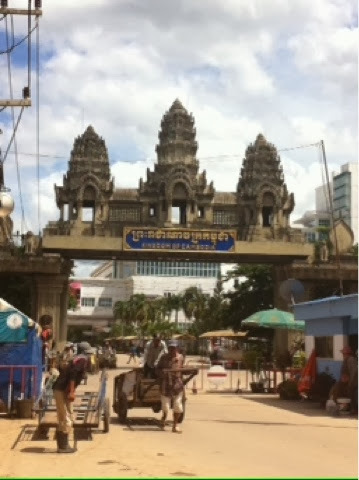 We then got another tuk tuk to the border office and felt slightly relived to be nearing Cambodia, especially since it was over 24 hours since we had set off on this journey! From here, we got a free bus to the taxi station, also housing Mr Thai's currency exchange - convenient! We were then practically millionaires - 4100 riel is $1, 5100 is £1 (or there abouts); I couldn't even shut my purse anymore! 5 of us then crammed in a tiny car and drove for around 2 hours to our hostel in Siem Reap. Mr Thai then had the cheek to ask for a tip for escorting and helping us, even though we know he ripped us off (and have since spoken to a number of other travellers about this - some have been conned, some confirming we had been). We hopped in this taxi, drove for a long time, before turning down a road which seemed very 'local' - here we were told to get out and our taxi driver informed us he wasn't willing to take us any further despite the fact we paid to be taken right to our hostel. At this point, we were at the end of our tether and convinced a tuk tuk driver to take us to our hostel free of charge - how we managed, I'm not sure. 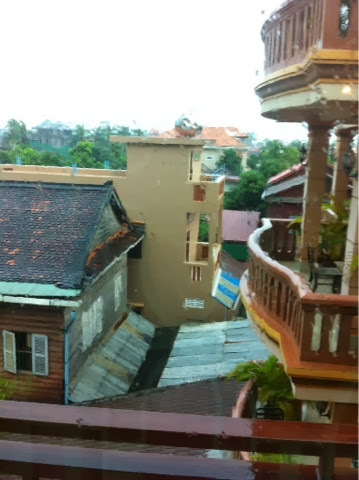 So when we arrived at our hostel, Downtown Siem Reap, we were all VERY happy! 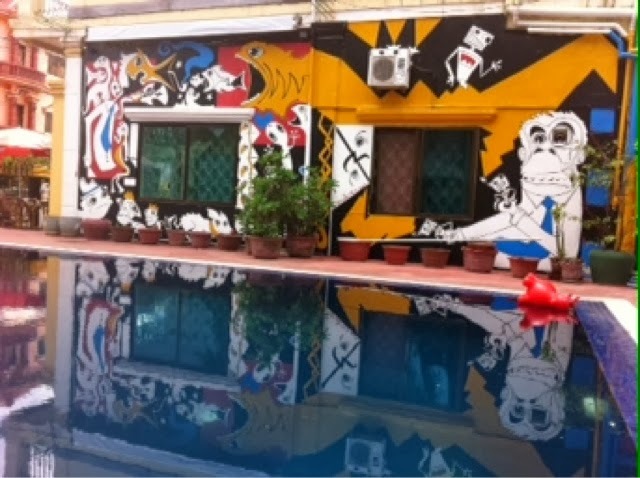 It looked great and had some funky art work as well as a pool. This hostel cost around £3 a night and I can definitely recommend it! I absolutely love this hostel, not only are the rooms great, the staff helpful and it's a 5 minute walk to Pub Street, it's also the most sociable one we have been in so far and the food is pretty darn good (and reasonably priced - a breakfast was around $2). The hostel is English owned, and I honestly think that showed - it was a different standard of hostel compared to those we had experienced in Thailand; the rooms were very English looking with fixed bunk beds and a fair few English options on the menu. The first night we had a wander out down Pub Street (which looked GREAT and it was obvious straight away the nightlife would be good!) 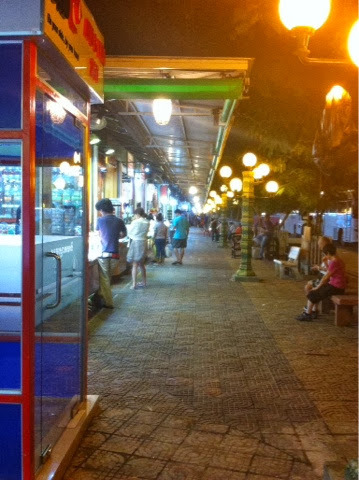 we found a nice little place, had some barbecue food and corn then headed down to the night market for a look around. 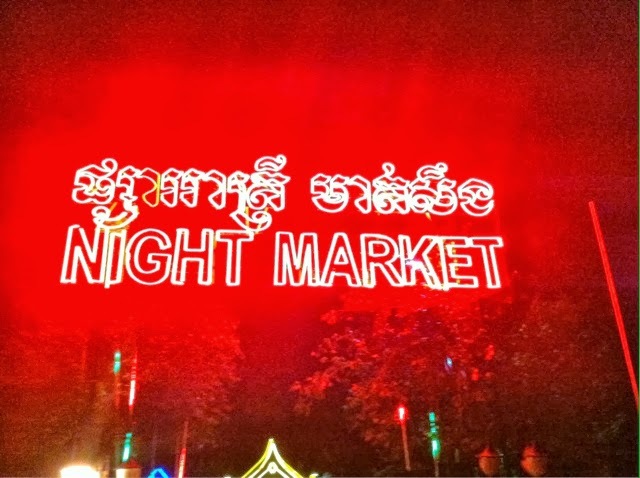 Everything is very similar there to the souvenirs and clothing you can buy in Thailand. The only difference? The Cambodians are a lot more pushy when it comes to selling you things. We called it a night pretty early after having two days of broken sleep! The following day we decided to had a lie in, chill by the pool then head out for a few drinks and to watch some traditional Aspara dancing at Temple Bar (which, underneath, was a club which looked like a lot of fun!)! The food at Temple Bar was amazing - I had shrimp Amok, Cambodia's national dish. Without meaning to sound ignorant, the dancing got a little bit repetitive after a while so we decided to treat ourselves to a foot massage and pedicure! It still astounds me how cheap this is - $6 and they do the an amazing job AND free beers at this one! We headed back relatively early again (I promise we weren't this boring for the whole holiday - I've had far too many buckets, followed by hangovers!) as we decided to go to Angkor Wat for sunrise, which meant up at 4am and out by half past. Angkor Wat deserves a post all of its own - incredible! Moral of this post - be wary of border scams! I was very sure we were being conned but started it doubt myself. Read up, be sure of the procedure and don't get caught out! Also, I've been living of banana shakes - amazing! I'm going to be the size of a house soon!